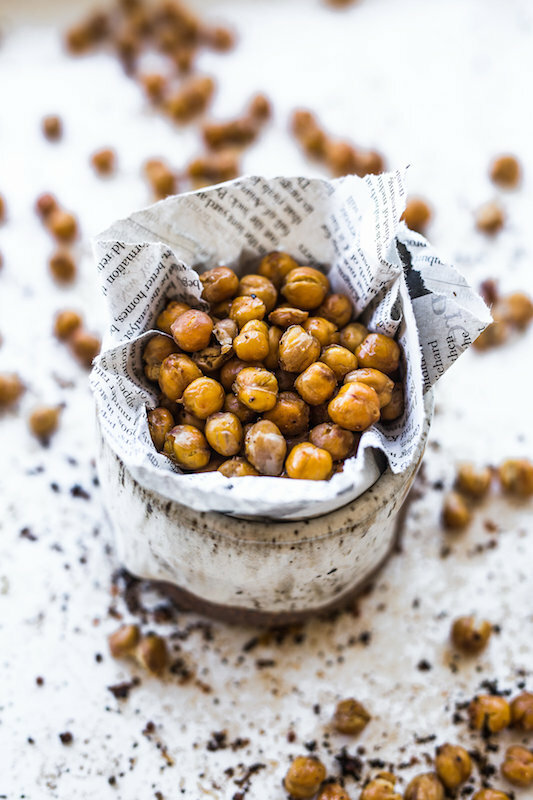 Take your humble tin of chickpeas to the next level with this easy-as roasted smokey chickpeas! As a source of plant-based protein and dietary fibre, this crunchy snack is a delicious option when you’re after a little something in between main meals. Drain chickpeas, pour into a sieve, rinse until the water runs clear and then pat chickpeas dry. Spread chickpeas over a baking tray. Using oil, generously spray until evenly covered. Sprinkle the smoked paprika and salt over chickpeas. Toss well until evenly coated. Oven-roast for 30-50 minutes until golden brown. Allow to cool before storing in a glass jar. Substitute the paprika with another of your favourite spices. You could even try a sweet option with cinnamon powder! The protein and fibre content of chickpeas help assist with appetite regulation. Protein and fibre together has been shown to work synergistically to slow digestion, and aid feelings of fullness (1) (2). Lattimer JM, Haub MD. Effects of dietary fiber and its components on metabolic health. Nutrients. 2010;2(12):1266-89.